AllMyNotes Organizer is an excellent notetaking application with various advanced features. It helps you save all your information including notes, passwords, bookmarks, pictures, etcs. Store all your Notes in virtual folders in one file! AllMyNotes Organizer has an innovative interface and multi-language support. All the notes are grouped into flexible virtual folders enabling easy, intuitive access, and instant search at all times. AllMyNotes Organizer - the simplest way to keep your Documents. Handling memos, records, and diaries was never been so pleasant until now. 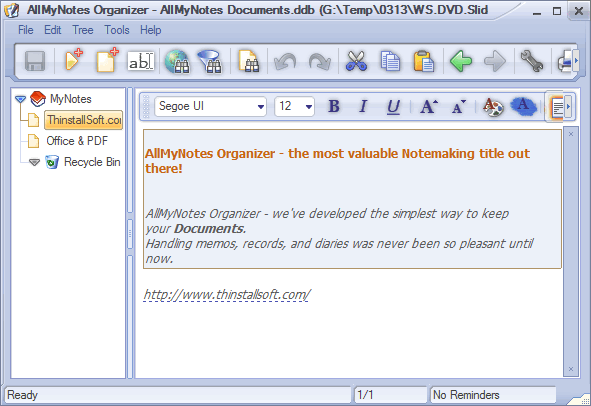 AllMyNotes Organizer Deluxe Portable is for non-commercial use only. Evernote Portable is another notetaking tool you should try. This entry was posted in Office & PDF and tagged allmynotes organizer, information manager, note, notetaking, pim. Bookmark the permalink.